Everest provides medical and rehabilitation care to adults with injury or disease which resulted in a temporary or permanent disability. People admitted to our hospital have varied medical problems, including: orthopedic surgery, stroke, lung disease, burns, disease or injury of the brain or spinal cord, amputation, and other medically complex conditions. 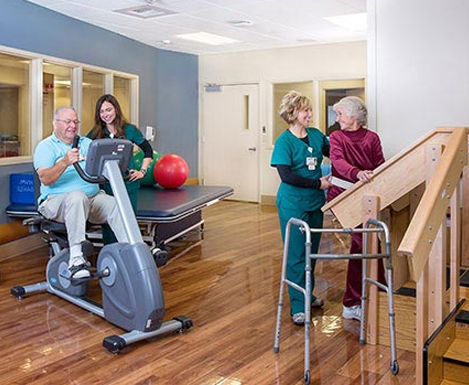 Comprehensive inpatient rehab helps patients regain strength and movement, and develop skills to live as independently as possible. Patients in our rehabilitation programs participate in therapy sessions that are designed to optimize their functional abilities. While at Everest, a group of therapists and professionals work together with the patient and family to coordinate care, set goals and keep track of progress. This is an interdisciplinary approach to patient care. The case manager is the primary individual who communicates with the patient and family regarding progress toward goals. The patient and family or significant other are considered the most important team members at Everest.